The Purple Machine was an Allied codename for one of several Japanese cipher machines used during World War Two. The nickname Purple Machine was derived from the name of the code the machine produced. The first intercepted Japanese code was dubbed "Orange" by American code breakers. As the codes increased in sophistication and difficulty to decipher, cryptologists referred to the various cipher permutations with the names of colors. "Purple" was the most difficult Japanese code to break, and was used to transmit diplomatic messages from 1939 until 1945. 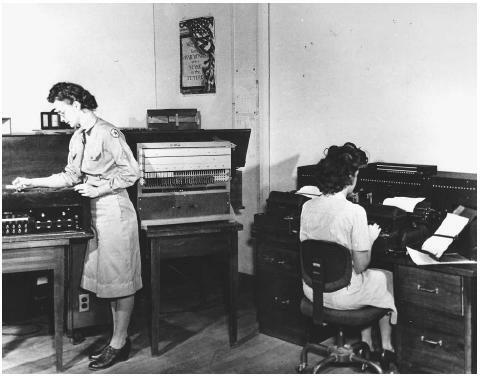 Two intelligence analysts work at Purple code deciphering machines at the headquarters of the U.S. Army cryptanalysis service in Arlington, Virginia, in 1944.
then be deciphered by again running it through the machine. While many pre-war Japanese codes were broken mathematically with pen and paper, effectively deciphering Purple required constructing an identical cipher machine. American cryptologist William Friedman built a replica of the Purple Machine, based on intelligence information, in 1939. When the machine became operational, American code breakers were able to monitor most Japanese diplomatic messages that used the Purple code. While breaking Purple gave U.S. intelligence services a great deal of information regarding diplomatic activities and strategies, it seldom yielded specific information regarding naval actions or fleet positions. The Japanese used a separate code for military operations, fleet positions, and troop deployments. In the months prior to the bombing of Pearl Harbor in 1941, Purple Machine intercepts indicated that the Japanese were planning an attack, but the messages did not mention Hawaii, Pearl Harbor, or a date for such an attack. However, the Japanese government did use Purple to deliver their ultimatum the day before the attack. Cryptologists decoded the series of fourteen messages between the Japanese government and their embassy in Washington, D.C., and passed the messages along to the Department of the Navy. A further intercept in the early hours of December 7, 1941, indicated that the Japanese fleet was poised and awaiting the order to attack. No action was taken on the information in the intercepts, and the U.S. Pacific fleet was bombed in port at Pearl Harbor later that day. After Pearl Harbor, deciphered Purple Machine intercepts yielded substantial intelligence information for the United States. Paired with deciphered Japanese Navy dispatches that used another broken code, Purple Machine intercepts helped the United States to victory at the battle of Midway. In the weeks before the battle, code breakers discovered a series of messages from Tokyo to Japanese diplomats and Navy officers that discussed battle strategy in the Pacific. Some of the communications yielded fleet positions. Decoded Purple messages also allowed Allied planes to track and shoot down a military flight carrying Japanese Admiral Isoroku Yamamoto. Breaking Purple Machine code even aided the Allied effort on the European front. A long series of dispatches between Japanese diplomats in Germany and the Japanese command in Tokyo discussed meetings with Hitler and revealed information about German defenses in occupied France. This information helped Allied forces prepare for the D-Day invasion of the continent. The Japanese remained confident throughout the war that the Purple Machine and its code remained unbroken by the Allies, and continued to use the code even in the weeks immediately following their surrender in 1945. In United States hearings regarding intelligence, military, and political oversights in the days prior to Pearl Harbor, the government revealed that it broke the Purple code before the outbreak of the war. It was the first time former Japanese forces heard that the secrecy of the Purple Machine had been long compromised. Clark, Ronald William. The Man Who Broke Purple: The Life of Colonel William F. Friedman, Who Deciphered the Japanese Code in World War II. New York: Little & Brown, 1977. Budiansky, Stephen. Battle of Wits: The Complete Story of Codebreaking in World War II. New York: Touchstone Books, 2002.